Basehunters Chasing will be out tonight and tomorrow morning live streaming the nor’easter in Massachusetts. Although the storm does not look to set any records, it will still be significant across portions of eastern and southeastern MA. A band of 8-12in of snow appears likely to set up along a narrow corridor between the Cape Cod Canal and Burlington, MA. If I had to refine this further, I would go with model consensus and would bet on this band setting up southeast of a line from Quincy, MA to PVD. Though run-to-run trends have been slowly shifting this heavier band northwestward. Therefore can’t rule out a very messy morning commute for Boston. The heaviest snowfall rates will occur between 5am and 8am EDT on Mon/21st. There is even the potential for an isolated instance of thundersnow and/or thundersleet during this period, as shown by the Lightning Threat 2 parameter on the NSSL WRF image below. Most likely significant travel impacts will occur on I-95 between PVD and MA-128, as well as much of MA-24 and MA-3. This forecast has been a headache for many a meteorologist across the northeast. The long-range models and their ensembles (GFS, GEFS, ECMWF, GEM, JMA, CFS, etc.) have shown this nor’easter for about 8 days, but moved from an inland New England track to an offshore track, then creeped northwestward to what we’re seeing now. The most frustrating thing is that the operational models sort of did this in tandem, eliminating any hope for a forecaster to try to isolate one that was more consistent. Indeed, up until 48-60 hours ago, it was only a GEFS outlier or two that showed a significant snowstorm for eastern MA and RI. So I’ll just throw a bunch of data here to illustrate the fact that the forecast has come together significantly, but as always, many uncertainties remain. GEFS plumes (above) for Boston show that the city will remain all-snow during this nor’easter. A safe forecast is 5-10in of snow for the city, with most of it falling during the early morning hours of Mon/21st. There is an outside chance that the city receives about a foot of snow. SREF total snowfall plumes (above) for Boston… ignoring the outliers… show a nice cluster between 5″ and 9″ of snow. The mean is about 6″ of snow. 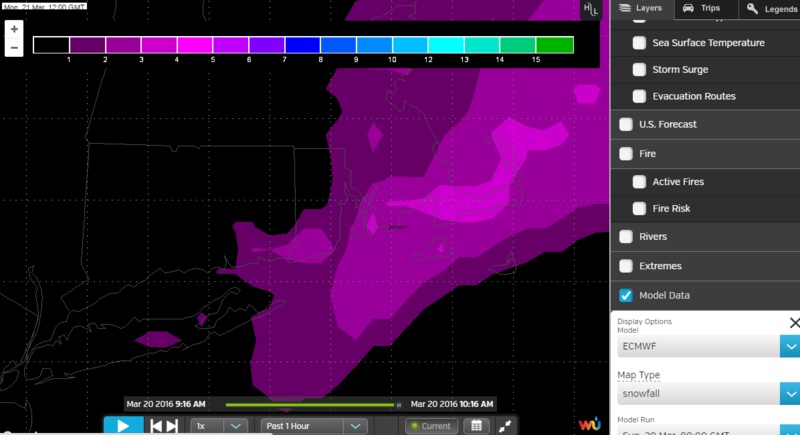 The 20/00z 4km NAM shows the highest-impact scenario with the heaviest band setting up directly along a line from PVD to BOS, with 12″ of snow falling. Snowfall rates of 2″-3″ per hour are not out of the question in this band. All of this snow falls before 8am Monday, with most of it falling between 5am and 8am. But the 20/06z GFS creeped NW with the band. And the 20/06z 4km NAM takes it a little easier with snowfall totals. The 20/00z ECMWF confines to heavy band to Cape Cod, with the heaviest accumulations… around 8″ occurring near the Cape Cod Canal. Subsequent model runs today will help pinpoint the exact location of the heavy snowband, especially when the HRRR comes fully into range. One of my favorite tools during the 2015 snow blitz was the SSEO. Here’s probabilities for >6″ of snow falling by 8am Monday. Looks like the mesoscale models favor the heavy band setting up closer Providence and Boston.